What up, party people?! 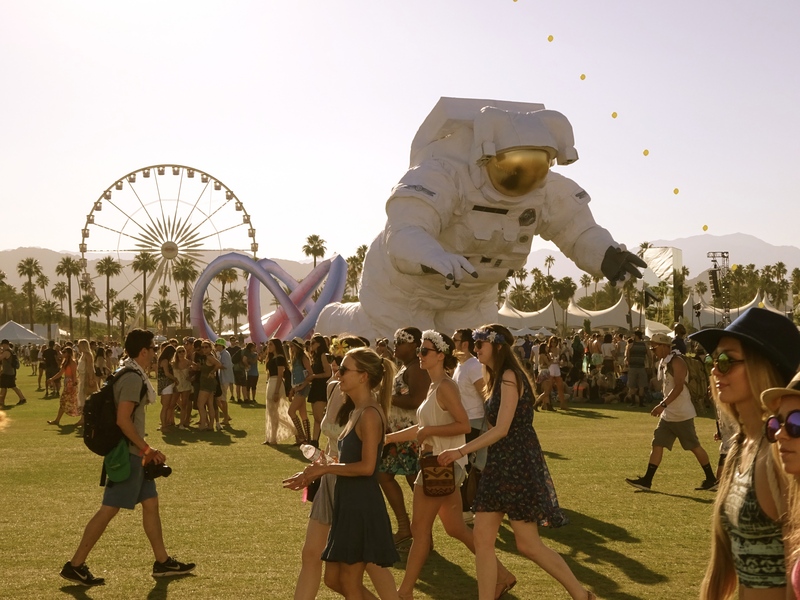 Coachella 2014 weekend one has come and gone but I’m still nursing my ringing ears and have a case of the munchies that just won’t quit. But hey, let’s get to the juice because that’s what you’ve come for. ROUND UP! 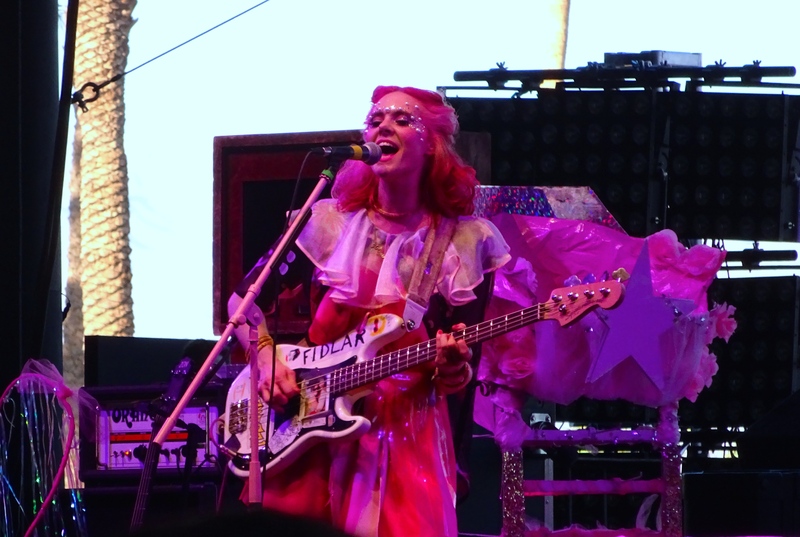 Kate Nash 5:50 pm – Pretty in Pink, Kate Nash shredded the Gobi tent with tracks new and old. An homage to FIDLAR on her bass and ferocious rendition of “Death Proof”, Nash jumped in the crowd for a routy dance party. New goal: figure out how to party with Kate Nash. Immediately. Ellie Goulding 6:40 pm – Speaking of ferocious, Ellie Goulding! Dang, girl! #FIERCE in a banded black top and little booty shorts (with a gold zipper running belly to….) Ellie laid it out on the stage as if it was the last show she would ever perform. Spinning up the hits including “Starry Eyed” and the Calvin Harris track “I Need Your Love” the crowd was dancing their hearts out and throwing the love back up on stage to Ms. Goulding. Woodkid 8:15 pm – Moody French producer/director/composer put together a solid set list from his debut album Golden Age. With self-produced and directed video accompaniment on stage, watching Woodkid makes me think if there was ever a breakup between Danny Elfman and Tim Burton (God forbid!) he would be the only person worth filling those enormous shoes. The Knife 10:30 pm – Holy toledo! Highlight of the evening, Swedish bro/sis duo The Knife came out of hiding after a seven year absence for a recent tour of Shaking the Habitual, and they did NOT disappoint (if you don’t trust me read this Hollywood Reporter review). 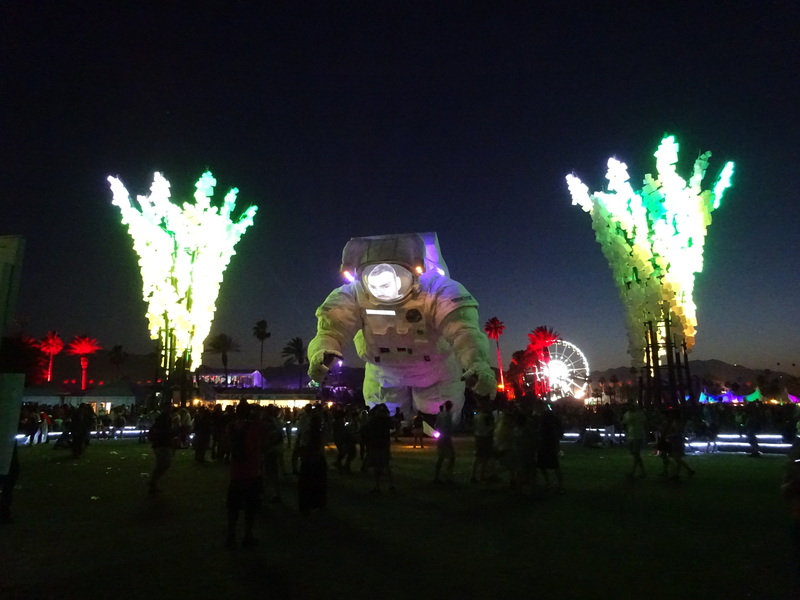 With what looked like eight space aliens in shiny hazmat suits, the whole crew performed tracks throughout their catalogue and started a dance party in the desert that wasn’t part of the candy-filled bonanza in the Sahara tent. 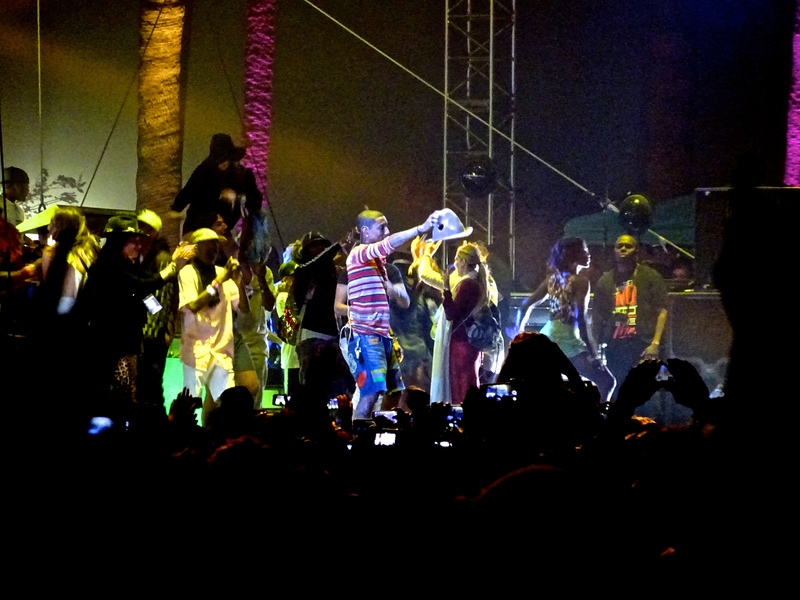 Outkast 11:30 pm – 20 years after the birth of Outkast, Andrew 3000 and Big Boi took the Coachella headlining set like the veterans that they are. Busting out the gate with hits “B.O.B.” and “Rosa Parks” the entire field was bouncing like it was the only place to be. Guest highlights included Future and the fierce and incomparable Janelle Monaé. Let’s just say the entire set was “So Fresh and so Clean Clean”. Washed Out 5:55 pm – Fighting the winds in the Gobi tent, Washed Out elevated the space with their etherial sounds. 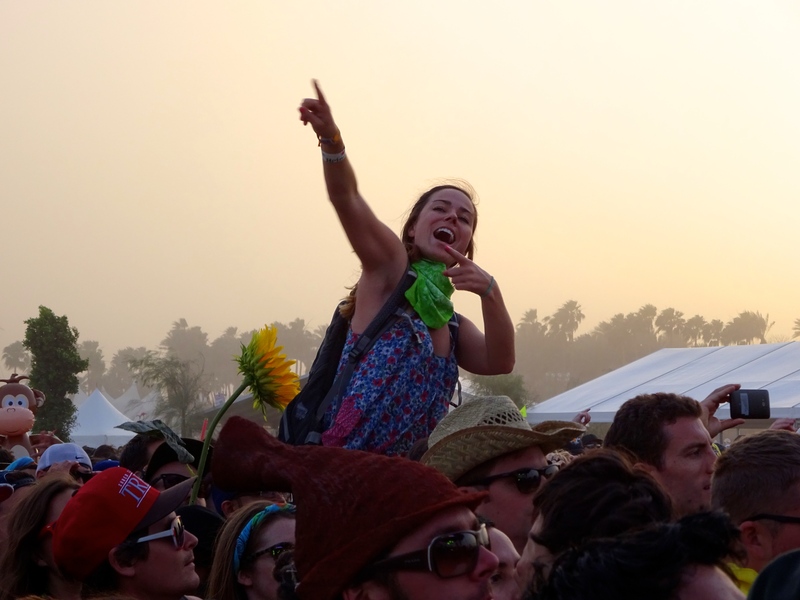 Coachella newbies, Washed Out was the perfect soundtrack to a quickly changing landscape and festival atmosphere. Warpaint 6:15 pm – The women of Warpaint brought the psych to the desert. My important revelation during this set:Warpaint would have been the perfect house party band in the 90s cult classic The Craft. Future Islands 7:05 pm – One thing you hardly see, a highly anticipated act coming on stage 10 minutes early to do their own soundcheck. Leaving all pretense at the edge of the stage, Future Islands commanded the eager crowd who were hanging on every word by frontman Samuel T. Herring. Future Islands performance was completely unmatched by any of their contemporaries and must, must see. Let’s just say there is so much dancing (Samuel’s moves are out of this world) and so many #feelz. Pixies 8:50 pm – Look who we have here! Late additions to Coachella, the legendary Pixies took over the Mojave tent with thousands of people who were ready for a sing-a-long session. Busting out the pseudo-hits including “Bone Machine” and “Where is my mind?” kept this gal very, very happy. Pharrell Williams 10:35 pm – I mean, come on. This set was so jam packed with special guests someone would have thought this was an episode of VH1’s Behind The Music. Gwen Stefani, Busta Rhymes, Nelly, Snoop Dogg, P. Diddy, Tyler The Creator all came out to join the Grammy Award-winner on stage for walk down memory lane. This made a whole lot of people very “Happy”. Final day! My face hurts. Rudimental 4:45 pm – One of the biggest acts coming out the UK with #1 singles out the wazoo, this electronic quartet did NOT disappoint. Putting the smack down hit after hit, the sweaty crowed forgot about the rising temperatures and gave in to the power of Rudimental. 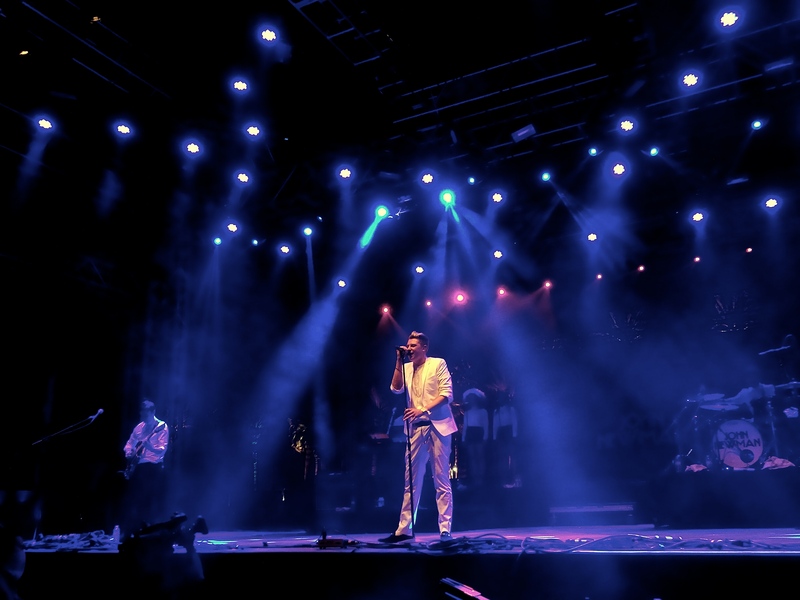 Of course, a special guest performance by UK superstar John Newman didn’t hurt either. Blood Orange 5:15 pm – NEXT. AlunaGeorge 6:25 pm – Coming out guns and sexiness blazing, the duo performed Disclosure collaboration “White Noise” and my all time favorite jam by the incomparable Montell Jordan “This Is How We Do It”. YES! Important moment of this set: I know EVERY WORD to the Montell Jordan classic. And so do you, yes you do. Calvin Harris 7:30 pm – Lights. Hits. And faces were subsequently melted in the desert. Lana Del Rey 8:15pm – Taking the stage is a red flowery sun dress, Lana Del Rey gave her best “I’m a diva, bow down” performance and the crowd was there in droves to watch it happen. 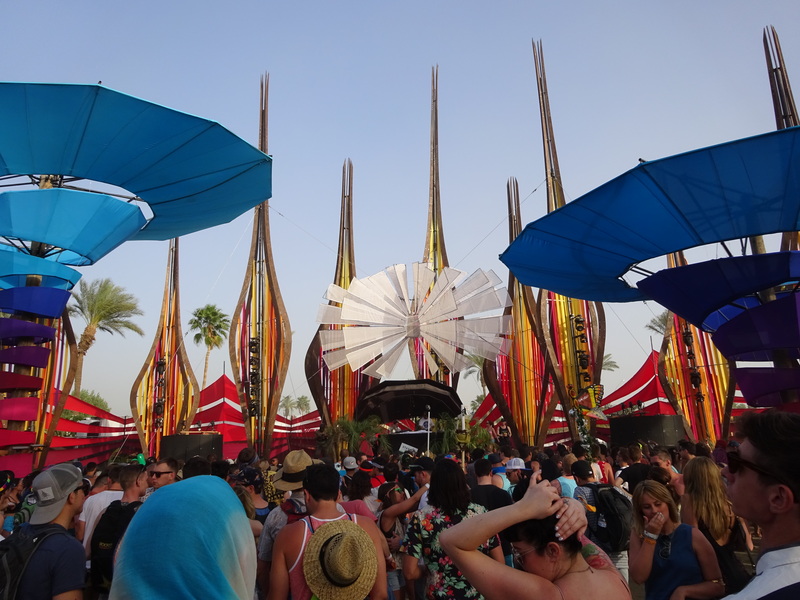 It was one of the biggest crowds on the secondary Outdoor Theatre stage I have ever seen at Coachella. But were we all buying it? The jury is out. Disclosure 9:35 pm – More face melting by the brothers of Disclosure. 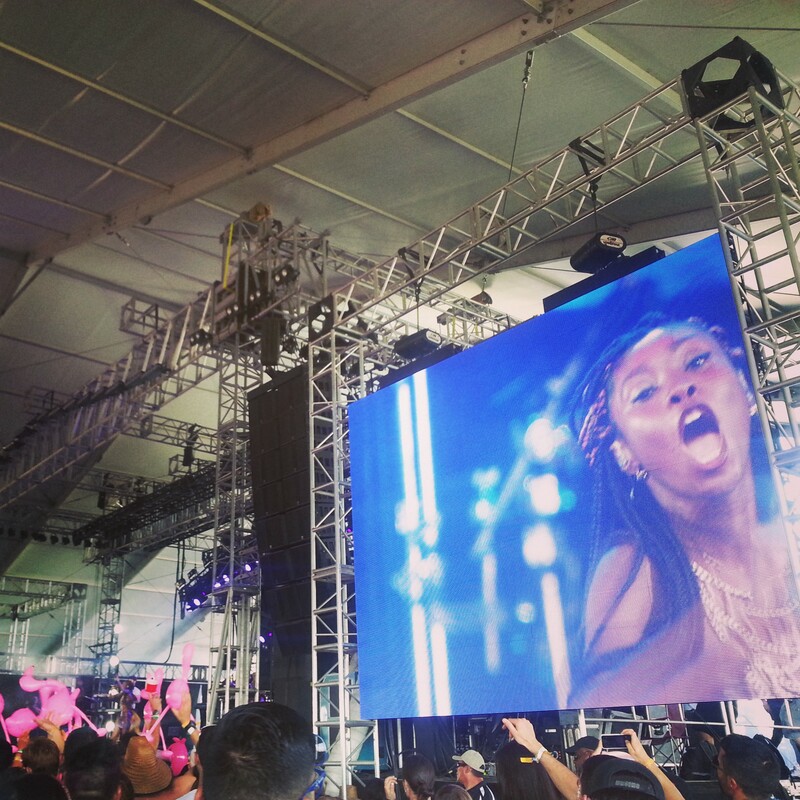 Last year they were on smallest stage at Coachella. This year, they have taken over the festival. Not a bad leap I’d say. Special guest performances by AlunaGeorge, Sam Smith (LATCH! ), and the one and only MARY J. BLIDGE. My heart skipped five beats, but no need to worry people. I was brought back to life by their performance of “F For You”. 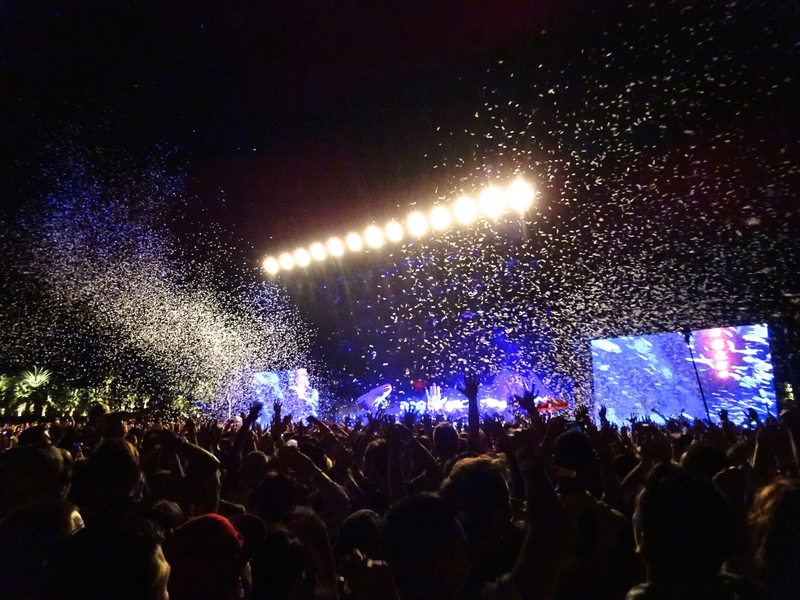 Arcade Fire 10:20 pm – Confetti! Shiny objects! Debbie Harry performing “Heart of Glass”!!! Arcade Fire will never let you down. That is all.